In 2015 an evolution began with the renaming of the property to The Roxy Hotel Tribeca - an infamous name that has a scintillating New York history. From the spectacular 1920s movie theater to the legendary 90s dance club The Roxy Hotel has followed in similar footsteps - quickly becoming an electric destination for music film and art. Partnerships with local icons such as Paul Sevigny - Pauls Cocktail Lounge - nightlife purveyors Vito Dieterle and Joseph Schwartz - The Django- and soon to be Jacks Stir Brew Coffee and Blackstones Hairdressing. 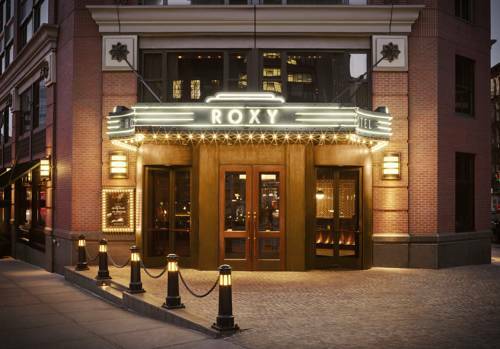 The Roxy is reenergizing the downtown Manhattan experience. Located on the border of SoHo and TriBeCa - two of downtowns most affluent residential neighborhoods - where cobblestone streets and historic cast iron buildings give way to the most exclusive boutiques restaurants and galleries. The Hotels triangular shape gives the property its inimitability most evident in its interiors soaring eight-story atrium. The expansive Roxy Lounge Bar and Stage is downtown New Yorks very own living room. With low-lying furniture it is an ideal place to lounge meet or work by day and the perfect place for cocktails or catch live music with friends at night.